The best way to have a wonderful Thanksgiving with delicious food and time to give thanks for our blessing is planning. 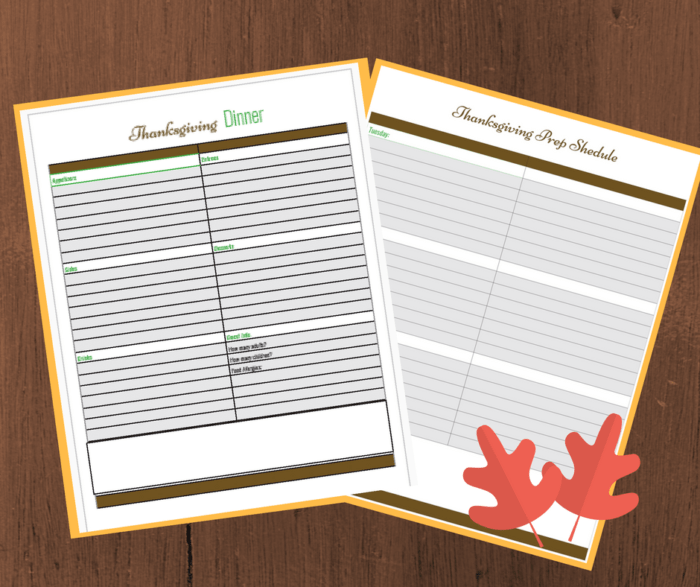 Use these printables and create a solid Thanksgiving plan. This Thanksgiving Printable Document Bundle has 18 pages that will help you plan the perfect Thanksgiving. These are the most popular sheets in the planner. In my book, You Deserve a Sparkly Stress-Free Christmas I give details on planning larger meals. However, a simple dinner for around 12 guests can easily be planned with these two sheets and a grocery list. Grab this free bundle and our newsletter! Halloween and Christmas get their fair share of fun family events. 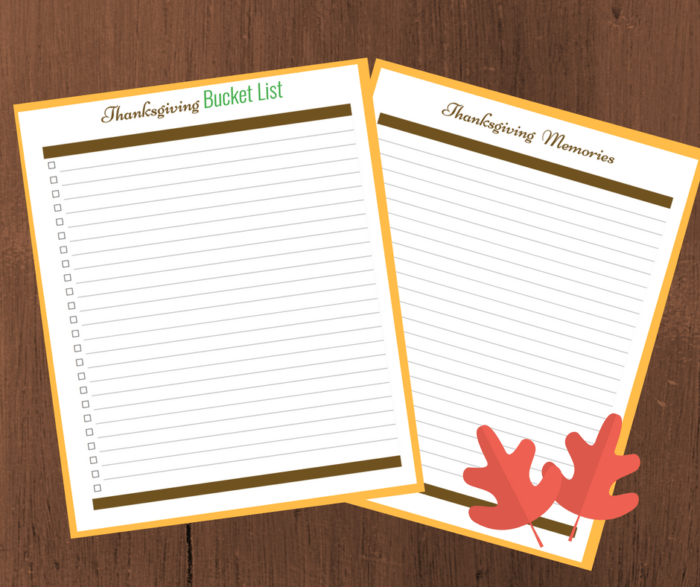 Creating a Thanksgiving Bucket List is a perfect way to experience new things with your family and friends. Included in this packet is printable document foThanksgivingsgivign Bucket List as well as a Memory page to write down all of your experiences! Here is what is in the free printable bundle! Honestly, I just kept getting more and more excited about different pages needed that I had to tell myself enough finally! 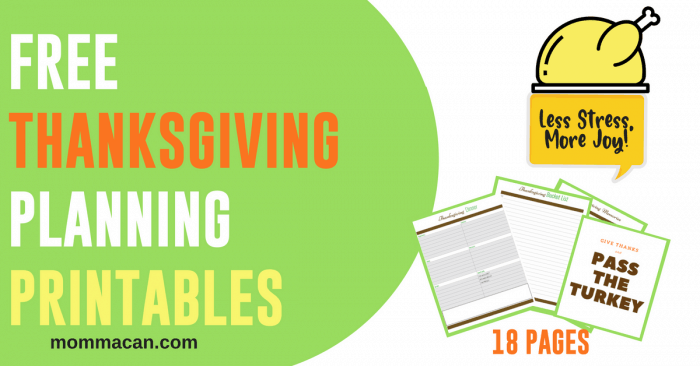 Here is the complete list of pages available in the Free Thanksgiving Planning Printables Bundle for Your Holiday! I Am Thankful For – Write down what you are thankful for this year. Brunch Planner – If you have older children, you sometimes have to get creative with sharing the holidays with sports and extended family. Planning a brunch can be the perfect answer. Thanksgiving Menu Planner – Plan your meal and Take not of food allergies of guests and how many adults and children are coming. Decorating Shopping list – also use this one to plan your place settings! Decorating by the Room – A simple room by room planner to put a little Fall Love in each room. Check out this fall post to get some ideas. Thanksgiving Prep Schedule – This sheet is very helpful. It allows you to plan what you can cook ahead in day increments. Psst. I also precook and crumble cornbread for dressing and make turkey gravy and cranberry sauce and freeze those as well. Thanksgiving Notes – Blank – Doodle turkeys and corn for hours or write down brilliant Thanksgiving dinner conversation starters. Recipe Cards – I suggest using cardstock for this one or enclose the printed recipe in a plastic sleeve. Crafty Thanksgiving – If you are planning on making crafts, here is your planning sheet. Thanksgiving Bucket List– I added this because it seems like Halloween and Christmas get all the fun. What would you like to write on your Thanksgiving Bucket List? Thanksgiving Memories – Print and write your memories from past Thanksgivings or write the new ones coming this year. Detailed Guest List – Great for potluck Thanksgiving celebrations. Blank lined paper, because you may want to write some elegant fall poetry or your Christmas wish list because it is just around the corner. New: Give Thanks and Pass the Turkey Fun Frame Worthy Printable! 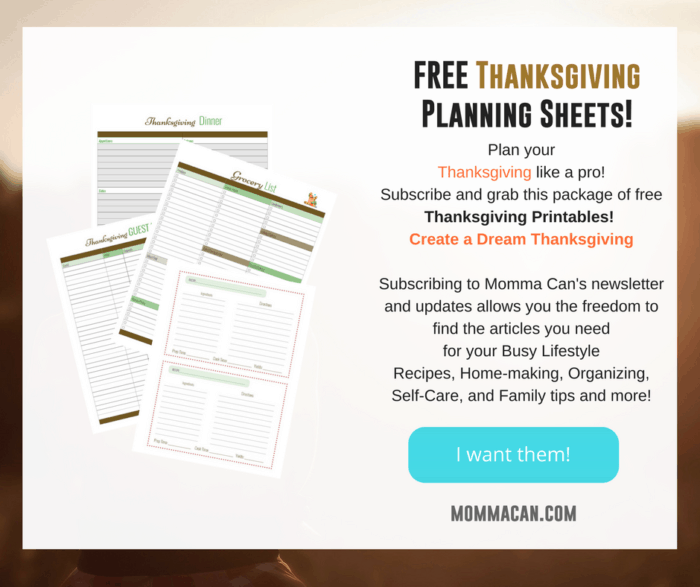 I hope you enjoy these Free Thanksgiving Planning Printables for Your Holiday! Please pin this post and share with friends. You are all awesome for dropping by and reading! Happy Fall To All! Pam I LOVE your planning printables!!! You did a wonderful job thinking of everything a person could possibly need to remember and do!! Thanks for sharing!! Beautiful printable as always Pam! You are so organized!!! Pam, thank you! Such a great idea, and so welcome at this time. Brilliant! I cannot believe how close Thanksgiving is to Christmas in the USA. It has to be a planning nightmare for American women. So hard to arrange, I’d be tempted on making double batches of side and freezing them for Christmas. The better planned, the easier it is to achieve. I love your Christmas Planner. I purchased one for my daughter in law and she loved it too. 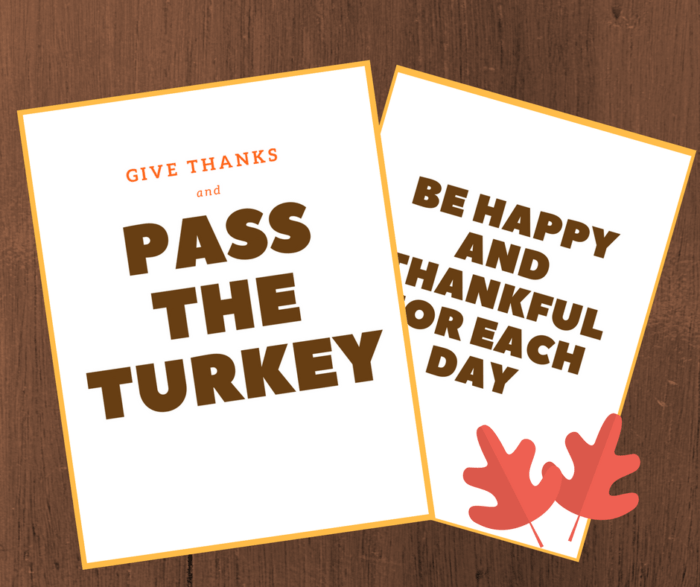 What an Amazing set of Printables Pamela I almost wish we had Thanksgiving here ! This is such a great planning resource!